Since the Small Grants scheme was launched in 2005 the Trust has donated over £130,000 to individuals, groups and carers in the UK. The purpose of these grants is to improve the quality of life for those with aphasia and their carers. The Trust makes up to £1,000 available for small grants each month. Applications are invited from people with aphasia, carers or groups living in the UK. No application is considered too small and the Trust hopes to be able to give as many grants each month as possible. Each person or group can apply up to a maximum of £1,000 per year. The image below shows the diversity of the grants. Other: is deliberately ‘non’ specific to allow people to think creatively and to ask for the non-obvious. The key thing is that any grant application must have improving the quality of life for those with aphasia at its heart. 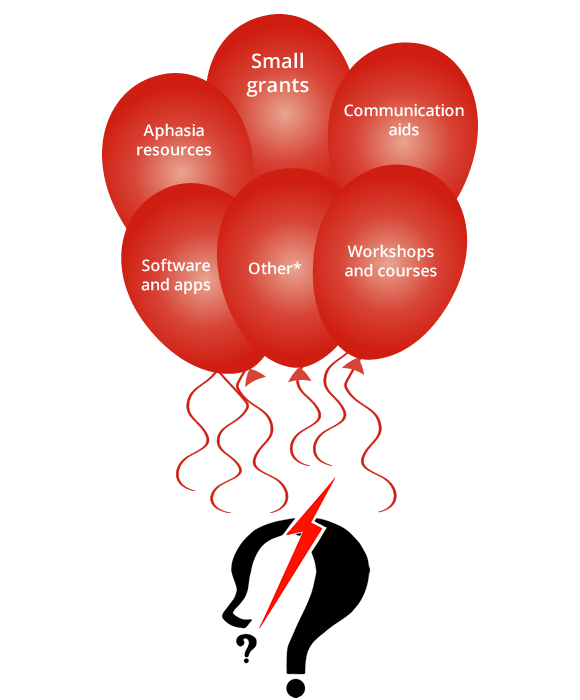 Of the many things we fund, aphasia software therapy programmes are most frequently requested. Before applying please take a look at the Aphasia Software Finder website. This website provides useful information, on one website, about aphasia therapy computer programmes and apps that are designed to help improve communication for people with aphasia. We hope this website will help all concerned make informed choices. If you or a friend has aphasia, we strongly recommend that you seek advice from a speech and language therapist with regard to which piece of software or app is the best one for the person concerned. You can apply online, download an Application Form or request one by letter, email or telephone. Applications can be for any amount, up to a maximum of £1,000. All applications must be accompanied by a supporting reference from a professional who is involved with either care for the person applying, or the group’s work. Applications are reviewed at the end of each month and you will be notified about the outcome of your application shortly thereafter. Please return your application form to the Tavistock Trust for Aphasia, see full contact details below. We ask applicants to make a contribution towards their small grant if they possibly can, big or small. If your application is successful, please download the Gift Aid form and send it in with your contribution. If you Gift Aid your contribution it increases its value by 25p for every £1 donated. As a direct result of people’s generosity, we have been able to fund more small grants.